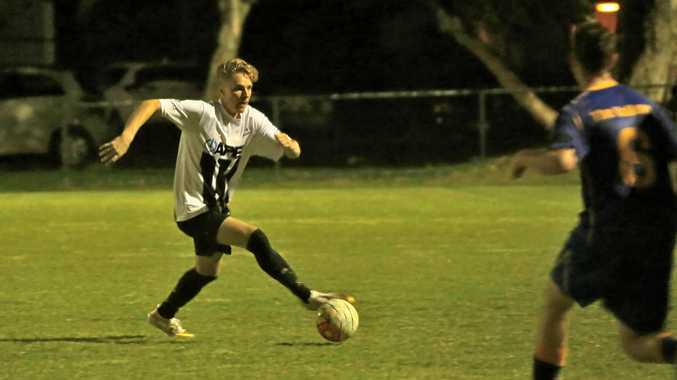 BYRON Bay have opened up a three point gap at the top of the table and kept their undefeated record intact after a 2-0 win over Mullumbimby in Round 3 of the Summer Youth League on Friday. In front of a parochial home crowd at the Rec Grounds, two goals from 15-year-old Zahi Addis made it three wins out of three to open the season. Having defeated fellow competition heavyweights Lismore Thistles in a mid-week match, Byron Bay went into Friday's match knowing a win against their local rivals would put them clear at the top of the ladder. It didn't take long for the Rams to find their grove with a mixture of passing combinations, impressive runs and a high-pressure defence causing the Mullumbimby defence no shortage of problems. Yet while Byron Bay were able to create several scoring chances, they were unable to capitalise and looked to be heading into the sheds locked at 0-0 before Addis made his mark in the shadows of half time. With only minutes remaining in the first half, the constant pressure defence paid dividends as Addis dispossessed Mullumbimby's centre back and slotted the ball past the keeper to open the scoring. It was more of the same in the second half with a hard-working Mullumbimby unable to wrestle back control of the match. Byron topped-off their commanding performance with a well-rounded second goal. A passing sequence which started in their own half was finished off by Addis to secure the 2-0 win. The Ram's next game is at home against Premier League surprise-packets South Lismore. The match will continue the new rivalry between the clubs after Byron Bay defeated South Lismore in the Premier League semi-final earlier this year. Kick-off is 7pm at the Recreational Grounds.